Click for "Charlton Heston Presents the Bible"
In May of 2007, Agamemnon Films re-acquired world-wide rights to "Charlton Heston Presents the Bible" from the original distributor, GoodTimes Entertainment, which went bankrupt. Fraser Heston commented: "We are delighted to regain this valuable, ever-green title and add it to our library." Agamemnon also re-acquired rights to a companion "Charlton Heston Presents the Bible" Book, Audio Recordings of Bible readings by Charlton Heston, and "Charlton Heston's Hollywood," a lavishly illustrated coffee-table book of personal career reminiscences by Charlton Heston. 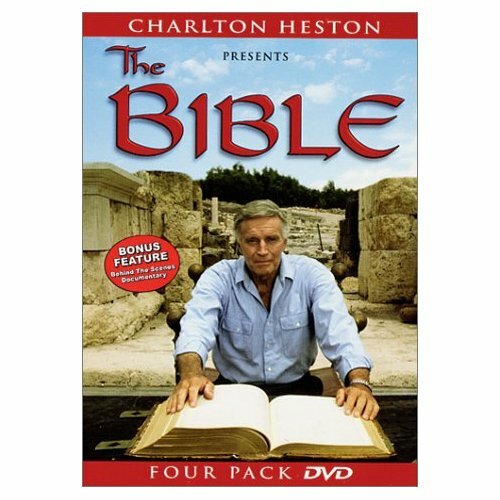 "Charlton Heston Presents the Bible" was re-released, in a newly "remastered and enhanced"
DVD (and CD) collection. Agamemnon partnered with Norman Direct to distribute the collection through a new infomercial, featuring Fraser Heston. Said Fraser: "I had the great pleasure of making several films with my father, but this was the one project closest to his heart." *A HESTJest: Knock, knock. Who's there? El Cid. El Cid who? El Cid wherever I want to sit.